New Delhi, April 25: The Indian Air Force conducted pan India Exercise Gagan Shakti-2018 from 08-22 Apr this year in a bid to achieve real-time coordination, deployment and employment of air power in a short and intense battle scenario. During the two-week exercise, more than 11000 sorties were flown, which include approx 9000 sorties by fighter aircraft. During Gagan Shakti-2018, lAF exercised its entire warfighting machinery to validate its concept of operations and war-waging capability. The focus of the exercise was to check the viability of our operational plans and learn meaningful lessons. The exercise was conducted in two phases so that all Commands get adequate opportunity to test the efficacy of their preparedness. Phase-I of the exercise involved activation of Western, South Western and Southern Air Commands, with affiliated Army and Naval components. 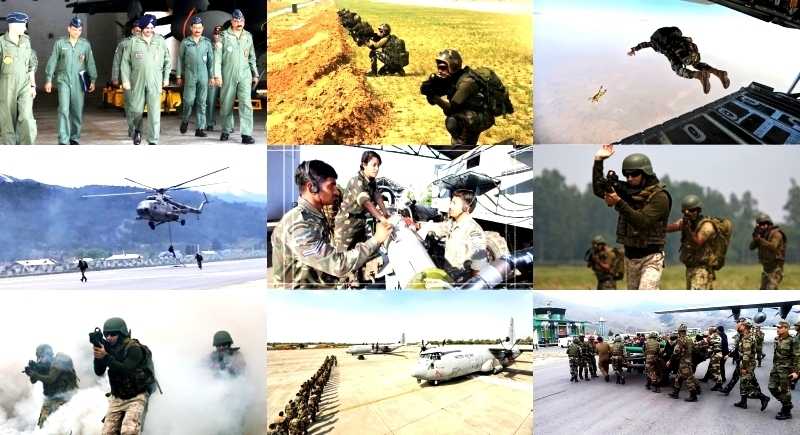 Phase-II of the exercise involved activation of Western, Central, Eastern and Southern Air Commands. Re-deployment for Phase-II involved relocating the forces so as to be effective at the new Locations within a short span of 48 hours. This was made possible by round the clock operations of heavy-lift transport aircraft like C-17 and IL-76 as well as by employing a large number of tactical airlift aircraft like C-130 and An-32 aircraft. IAF also used civil chartered flight and trains for mobilization of resources. During the exercise, all types of combat missions, encompassing all air campaigns, were conducted. Fighter aircraft undertook surge operations i.e. generating a maximum number of sorties in a 24 hours cycle. These included long-range missions with concentrated live and simulated weapon releases across all air to ground ranges in India, creation of Air Defence umbrella to facilitate operation of ground forces and Counter Surface Force Operations in support of Army in various sectors, during both phases Maritime Operations involving long-range maritime strikes with Maritime Reconnaissance support by Indian Navy aircraft were also practiced. The efficacy and integration of indigenous LCA aircraft and Akash Missile system in the operational matrix of the IAF was also checked out. In addition, capabilities of upgraded Mirage-2000 and MiG-29 aircraft were tested for the first time in an operational environment. All types of aerial weapons, including standoff and precision weapons, were employed to validate their use in the Air Operations Matrix. Combat Support Operations involved missions by force enablers like AWACS and Air to Air refuellers, Special Ops comprising a Battalion Group para drop, Special Ops with Garud Commandos, Combat Search and Rescue for effective extraction of downed aircrew behind enemy lines, sea rescue and operations from Advanced Landing Grounds. Army troops and combat vehicles were deployed to simulate Tactical Battle Areas in all Commands and some of the Army exercises were dovetailed with air operations for simulation of the realistic battlefield environment. Ships were deployed, both in the Arabian Sea as well as in the Bay of Bengal, for anti-shipping strikes by IAF maritime aircraft operating from bases on the east and west coast, as well as from island territories. To sustain the tempo of operations on such a large scale, on a 24 x 7 basis, the training status of entire IAF was enhanced, especially the aircrew. All qualified and medically fit crew up to 48 years of age were made proficient and current by giving them re-validation training on combat assets, employed during the exercise. Even the technical manpower focused on their primary tasks and rehearsed their SOPs/ practices in the run-up to the exercise. Over 1,400 officers and 14,000 men were pulled out of training establishments and deployed for the exercise, to augment existing resources. All operations were conducted in a Network Enabled scenario with a very high reliability of communications, networked air defence systems employing op enabling the software. A major highlight of the exercise was a very high availability and reliability of all combat assets including aircraft, missile systems and radars. High tempo operations also enabled the IAF to ascertain sustainability of the logistics chain. This had been possible due to good planning and dedicated efforts of our air warriors as well as continuous support by DPSUs that is HAL, BEL and DRDO. Flight line unserviceabilities were promptly rectified by a dedicated maintenance crew. The logistics stamina of the IAF and the ability to sustain continuous operations through day and night was put through a rigorous assessment. Contingencies such as repair of battle-damaged aircraft and relocation, of essential services due to enemy air action were also practiced. The exercise also focused heavily on base security aspects. Simulated drills involving infiltration into an operational area by various means were practiced. Dedicated contingencies were conducted towards sustaining operations in a Chemical, Biological, Radiological and Nuclear attack scenario. Different techniques for repairing runway after bomb damage was practiced in addition to the restoration of essential services and mass casualty evacuation at forward bases. Extensive coordination with Territorial Army Units and Local Civil Administration was undertaken to refine response to various security and administrative contingencies. Exercise Gagan Shakti-2018 provided IAF with an excellent opportunity to practice its wartime drills and undertake operations in a realistic scenario. Activities were undertaken in a cohesive manner to achieve the stated objectives of the Indian Air Force, in case of any contingency. The exercise also enabled the IAF to validate the operational efficacy of new platforms and refine existing Standard Operating Procedures. Joint operations with Army and Navy, conducted during the exercise, would help in achieving better operational synergy between the three services, in the application of combat power.